It’s a timebox, it has served its purpose and has succeeded when it ends. Though you can do quite a few things to diminish your learning from such a timebox. That’s maybe a failure of the scrum team then. I would put it even stronger. Not even a canceled Sprint is a failed Sprint. It was canceled because -for whatever (really important) reason- it totally made no sense to continue the Sprint. Still not what I would consider a failed Sprint. Even if we cancel a Sprint, there most likely will be learnings, hence not a failed Sprint. Would you agree? Not sure, Ari. 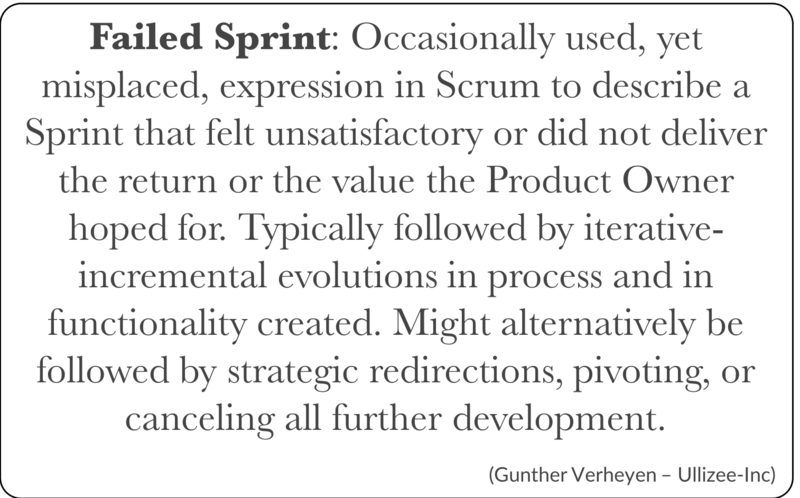 A cancelled Sprint, in my view, is just that, a cancelled Sprint. A Sprint that was stopped. It is traumatic, but probably even less about fail/success than anything else in Scrum. The only certainty is that such a Sprint did not deliver the value or return that was hoped for.